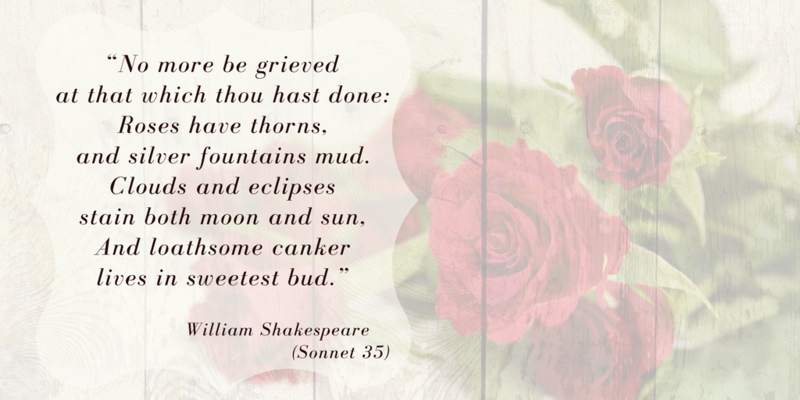 Happy Sunday and today once again I am partnering Roses in Literature with #ShakespeareSunday. This weeks theme was set by NYC Central Park on Twitter. Click the image to visit their page. Listen to how the Shakespeare garden came into being after a Black Mulberry from Shakespeare’s home town of Stratford-upon-Avon was planted in the park way back in 1880. To find out more about Central Park’s Shakespeare Garden click HERE. 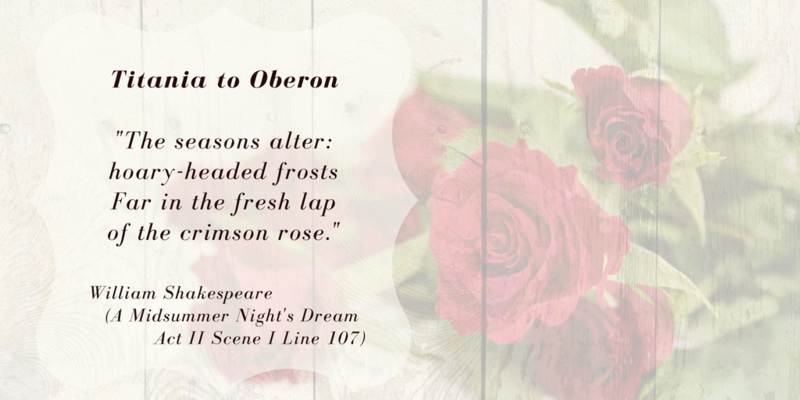 Roses in Shakespeare Hamlet ~ Laertes to Ophelia. This is a rather sad scene Laertes is home, he is brother to Ophelia. When he sees her he becomes angry, for she has been driven to insanity. She is in love with Hamlet but, earlier in the play, he not only spurns her, but murders her father. At the end of the famous ‘mad’ scene; she hands out flowers with telling messages. This is a very strong and powerful scene and has to be one of my favourites of the play. that stole his master’s daughter. we may call it herb of grace a’ Sundays. You may wear your rue with a difference. but they wither’d all when my father died. Now here is one of my favourite rose images, I took it in the garden of a book festival in Leominster, West Midlands UK back in 2015. Thank you for visiting, I hope you enjoyed this weeks theme. 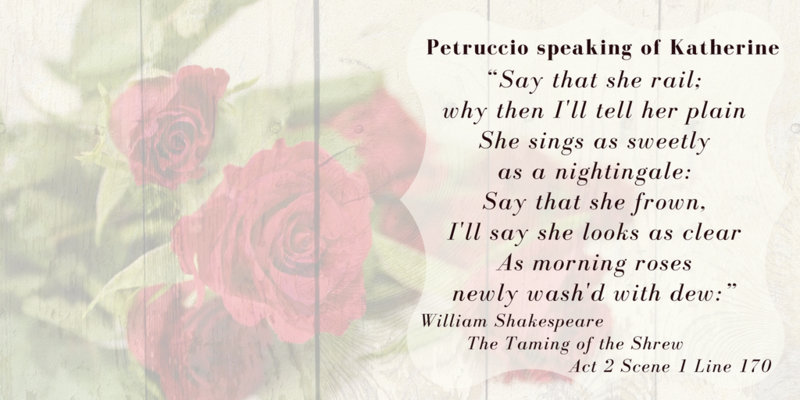 Today I am combining roses in literature with #ShakespeareSunday the theme for today is Love & Controversy! I chose ‘The Taming of the Shrew’ because of it’s controversy of how women were expected to behave. Some scholars even believe that in this play Shakespeare was actually championing women’s rights. The play begins with several men wooing the beautiful Bianca, the daughter of a rich merchant Baptista. However, he will not allow his youngest daughter to marry until his eldest daughter Katherine with a sharp tongue, and aggressive behaviour is married off first. Petruccio comes along rising to the challenge to ‘Tame the Shrew’. In the end it is not the meek and beautiful Bianca who bows to her husbands bidding but the transformed Katherine. Click HERE to read a wonderful article featured some time ago in The Guardian where several people including actors read the play very differently. This clip was taken from an American TV Series Moonlighting staring Bruce Willis and Cybill Shepherd. It is a fun version of the meeting of Petruccio with Katherine and throws in a few parodies from other movies. This is Katherin’e final speech taken from the movie staring Elizabeth Taylor as a very convincing Katherine and Richard Burton as Petruccio. I really enjoy Shakespeare Sunday and I am finding a great love for the works of this wonderful classical author. Thank you for stopping by hope you enjoy these post too. 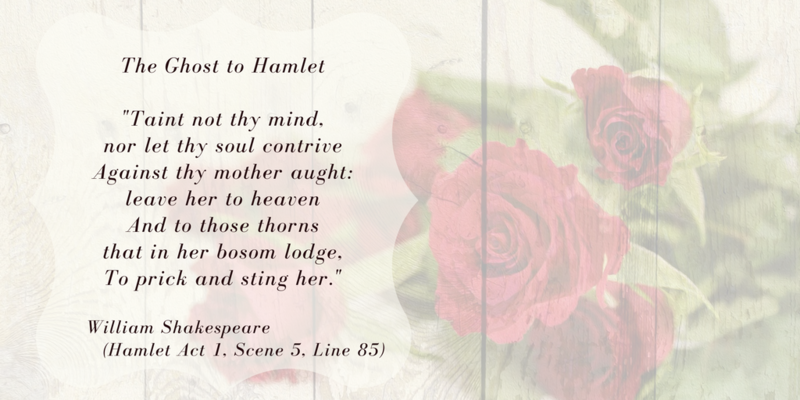 As I have already done a blog post on #ShakespeareSunday this will be brief as I discovered in the previous post that Titania’s speech also mentioned the rose. I just could not resist sharing this as a ‘Roses & Literature’ post. To find out more about this scene from A Midsummer Night’s Dream visit my previous post by clicking the image below. Happy Sunday today’s theme for #ShakespeareSunday is Earth, Water, Air & Fire and I’ve chosen a scene from A Midsummer Night’s Dream written 1595/96. 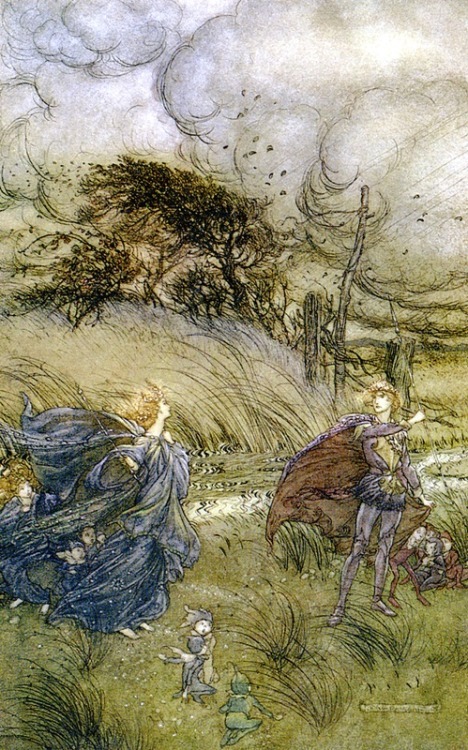 Titania vs Oberon, the beautiful illustration below is by Arthur Rackham circa 1910 (Click the image to enlarge). In the scene I have chosen Queen of the Fairies Titania bumps into King Oberon in a glade near Athens close to where Theseus and Hippolyta are to be married. They argue because Titania believes Oberon loves Hippolyta and wants to bless their marriage. They go on to argue about the changling child Titania has taken, whom Oberon wants. She accuses him of spoiling their fun ‘with thy brawls thou hast disturb’d our sport.’ Then he storms off. More details can be found online I used SparkNotes click HERE. The clip is from the 2002 version starring Michelle Pfeiffer as Titania and Rupert Everett as Oberon. A Midsummer Night’s Dream is my favourite Shakespeare Play I have seen it performed in many different theatres and formats. My favourite has got to be when I saw a late night performance in the open air of the beautiful surroundings of Ludlow Castle, Shropshire UK. Check out some of the copyrighted images by Photo Stage click HERE. Scholars around the world have analysed and broken down the meaning of the sonnet’s of William Shakespeare, and there are some wonderful blogs and websites you can check out for yourself I like the blog posts of Interesting Literature. Click HERE for their analysis of the sonnet. My thoughts in a nutshell are that William, is forgiving the youth for straying into pastures new. 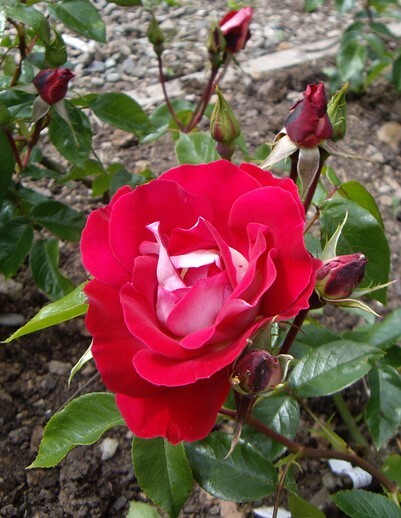 He tells us that even things of beauty such as the rose are not always perfect. 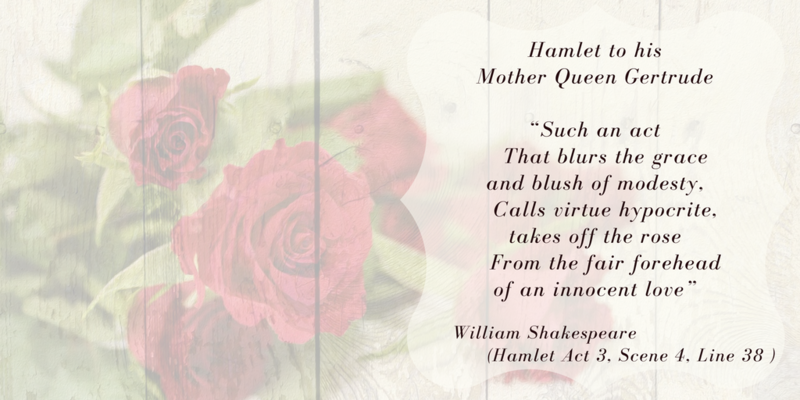 Today being Mother’s Day in the UK the theme for #ShakespeareSunday is of course Mothers. I have chosen my short verse featuring Roses in Literature from Hamlet, so thought it befitting to feature Queen Gertrude the widow of the late King of Denmark he now the Ghost in the story. The scene I chose to share is where Hamlet meets the Ghost of his Father and the truth of his death is revealed. Telling how the King was killed by his brother Claudius who has now sweet talked Queen Gertrude into becoming his wife, therefore making him the new King. The Ghost is asking his son to seek revenge. The above quote is at the very end of the video.